Enjoy Orange County Coastal Mediterranean-style living in this custom 3 bedroom (4 beds), 2.5 bath home in the beautiful, renowned, gated golf course community of San Juan Hills in San Juan Capistrano, California. The location is optimal as it is mid-way between San Diego and Los Angeles, lending itself to less drive-time, leaving more time for site seeing and fun-filled travel experiences (Disneyland, Knots Berry Farm, Hollywood, Universal Studios, Catalina Island, Coronado Island, Legoland, Del Mar Race Track (horse racing),San Diego Zoo, Sea World, Torrey Pines Golf Course of La Jolla, the famous Pageant of the Masters and Sawdust Festival/Laguna Beach, hiking, biking, beach-going, surfing & swimming, picnicking, deep sea fishing, whale watching, sailing, kayaking, paddle boarding, hiking, mountain biking, art walks, antiquing, wine tasting, discovering the historic Mission San Juan Capistrano (take-in a concert under the stars in summer!) in the quaint and charming heart of downtown. Here, you will also enjoy a wide variety of restaurants (lots of patio dining! ), pubs, galleries, boutiques, coffee houses, antiques, strolling the Los Rios Historical District, to include a park and petting zoo. The train depot (Surfliner & Amtrak train service) is minutes from the house in downtown SJC, making day-coastal excursions a breeze! You are only 1hr 45mins - 2hrs from Bear Mountain & Snow Summit in beautiful Big Bear Lake, CA, where skiers & boarders may opt for a little downhill action and snow play following a morning surf session (see vrbo.com/95590 for log cabin lodging)! You will enjoy all this and more at your disposal when lodging at this exclusive San Juan Hills coastal home. 2 minutes to the 5 FWY N & S (feeds into the 405N), another 2 minutes to the 73N. corridor (tollroad system) and 2 minutes to Pacific Coast Hwy, north & south. Tommy Bahama meets Ralph Lauren at Costa Paradiso! This coastal~equestrian home is situated only a couple of miles from the ocean as a crow flies, surrounded with equestrian centers/trails and activities (horse shows & rodeo) where sea breezes will continually refresh you, whether indoors or out, in this Capistrano charmer. Where fairways, ponds, giant hills (offering many hiking trails where you're sure to see horses coming over the ridge line with the hill views every window of the home~and yes, the occasional bunnies and deer!) and wildflowers are your landscape, this completely custom stucco home with terra~cotta tile roof shall delight your every whim. Complete with high-end finishes and custom details throughout (granite, marble, sandstone, crown molding, trim, window casings, stainless steel appliances), no expense was spared when considering your needs and enjoyment. This home is truly unique to the community in that it has a sizable wrap around yard with lawn and 2 patios extending 3 sides of the property. 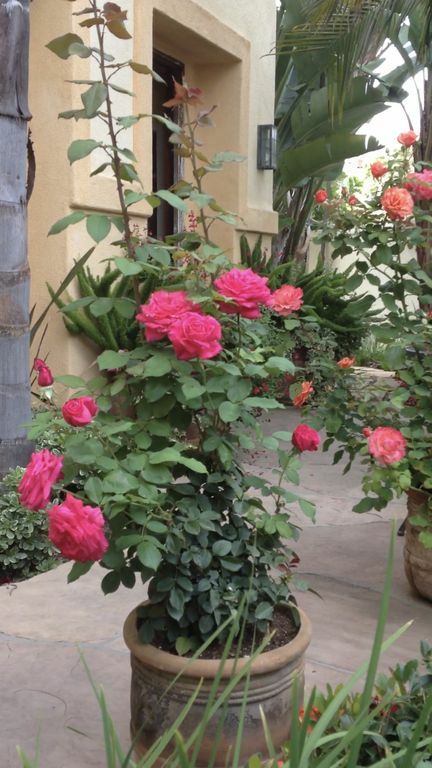 You'll experience tranquility at it's best with beautiful rose gardens, herb garden (for the culinary enthusiast! ), palm trees, banana trees,and giant birds of paradise.The master suite is light and bright, being privately situated in the treetops of the palms, having a Romeo~Juliet terrace and picture windows that overlook the expansive surrounding hills . . . romantically reminiscent of the Alps in “The Sound of Music!” The en suite provides a custom marble shower with built in bench seat, as well as a large, luxury pedestal-style spa bathtub for maximum relaxation, and dual vanity. The kitchen is open to the dining area and living areas, opening to the outdoors on two sides.This arrangement lends itself nicely to convivial conversation amongst family and friends as you invite the outdoors in! Take advantage of the community swimming pool, spa and fitness center, golf, golf club and trails as a way of welcoming more leisure into your day! Summer Dreamin’?? Plan now for dinner and live music under the stars at the historical Mission San Juan Capistrano for a night to remember (tickets may be purchased online~ tree lighting and choral candlelight procession during winter holiday season!)! 2 parking spaces in garage. Please advise owner if will need additional parking. 2 car garage. Please be advised cars are to be parked in garage~be mindful of size when renting vehicles with this detail in mind. Please contact owner with questions or concerns. Fitness Center within the gated golf course community offers a variety of cardio & weight training equipment. Pool and spa available. Comfortably seats 7+, includes a twin plus-sized sleeping chaise for your comfort and convenience. Enjoy the big screen smart TV (plus Netflix! ), fireplace, open to dining area, kitchen, patios/yard. Keurig coffee maker for single serve and for carafe brewing as well, Auto-drip/brew basket for 12 cups and smaller auto-drip brew basket for 4 cups, provided. Fully equipped kitchen:Stainless steel appliances to include gas oven/range, refrigerator/freezer,dishwasher & microwave,small electrics,pots,pans,bakeware,dishware,glassware, silverware, cooking ut. 3 barstools are available at bar and additional folding chairs available for more seating at dining table. For your viewing pleasure, TV is located upstairs & down with broad channel spectrum and complimentary Netflix. Cable and whole-house DVR included. Cable TV is easy to use as you simply speak into the remote to access favorite channels, programs, movies and whole-house DVR recordings. Enjoy! Stereo system is available for guest use, located in built-in cabinet in living room. Available in living room & master bedroom. Beautiful rose garden, herb garden, palms, banana trees, giant birds of paradise adorn the yard (lawn and 2 patios) that surround 3 sides of the home. Relaxation and outdoor enjoyment at it's best! The Juliet balcony off master bedroom is privately nestled in the treetops of the palms, having vast hill views and ocean breezes. Beauty and romance abounds! Enjoy the beautiful, tropical landscape that wraps around 3 sides of the home, offering lawn and 2 patio areas with tables, chairs and umbrella. Costa Paradiso is idyllic for bringing the outdoors in! Several boogie boards, beach chairs & towels, and beach umbrella available for guest use. Use boards at own risk. Lovely public golf course and clubhouse with restaurant surround the San Juan Hills gated community. Beautiful pool with new pool furniture, fitness center and spa in a tropical setting (see photos) for your enjoyment and relaxation! Community pool, hot tub and fitness center for your enjoyment! Beautiful!!! The house was very comfortable and had everything we needed for our stay. The owner was more than accommodating to our needs and provided timely response. The location is quiet and peaceful-the perfect place to enjoy a relaxing evening outside on the patio in a beautiful and private setting. The house and property are exactly as represented, no surprises! This home is absolutely perfect and beautiful in every way! The location is quiet, safe and peaceful. It has quick and easy access to the freeway, downtown San Juan, Dana Point and others. The accommodations are comfortable, thoughtful and nicely arranged. The owner takes pride in this property and it shows; they were also very responsive to any of our needs or questions. I would highly recommend staying here! * Property is a NO SMOKING/NO PET environment; parties and events are not permitted. Please inquire within as to flexibility on minimum night stay with concerns for either an extended stay or shorter-term stay and the rates, therein. Signing of Rental Agreement is required. Minimum age of financially responsible traveler/guest is 32 years of age. Advise owner if infant/toddlers are in rental party.